Music is an art of change - sounds progress and evolve through time; themes are mutated, elaborated, and fragmented; and the beauty of the art form itself works a change in our souls. This season we explore all the ways that transformation affects music: songs turn into dances, chants turn into secular pieces or popular songs turn into devotional works; a simple piece becomes a virtuoso showpiece through the application of ornamentation; a melody is borrowed from one tradition and transformed into something completely different by another culture. Stories and songs about change and transformation are very common from Greek mythology through religious mysticism, with the magical miracles of the Cantigas de Santa Maria being merely one example. At World Fellowship’s Early Music Week, 2018, we will explore this fruitful and multifaceted perspective on the performing arts with the help of our talented and energetic faculty, inspired by the breath-taking natural surroundings of Mount Chocorua and Whitton Pond, and sustained by the garden-fresh organic vegetables on our dinner plates. Nature has provided musicians with inexhaustible inspiration since the days of Pythagoras. Natural imagery informed the lyrics of many medieval songs and musicians expanded their music by imitating the sounds of birds and animals, whose physical gestures also inspired new dance movements. In the Renaissance, the dynamics of wind and water gained their musical counterparts, and it wasn’t long before madrigals were turning landscapes, with their mountains, valleys, plains, heat and cold, heights and depths, into song. The inner aspects of human nature, such as pulse, breathe, sleep, excitement, rage, melancholy, and sorrow, came to be represented as well, often in a pastoral setting, with the help of musical-rhetorical figures. In the resulting form, opera, instrumental music and dance (along with costumes and scenery) brought the natural and human worlds together. At World Fellowship’s Early Music Week, 2017, we will explore this fruitful and multifaceted perspective on the performing arts with the help of our talented and energetic faculty, inspired by the breath-taking natural surroundings of Mount Chocorua and Whitton Pond, and sustained by the garden-fresh organic vegetables on our dinner plates. Join us and discover your inner natural musician. With special guest dance/choreographer Ken Pierce, the WF EMW will explore the profound influence both Italian Renaissance and French Baroque dances had on music for the theater and chamber. Dancers will have dedicated time for the dance alone with Mr. Pierce, as well as some opportunities to collaborate with music classes throughout the week. Musicians will play dance suites, dance songs and theater music all heavily influenced by the dance of these styles. The workshop consists of group classes tailored to the playing abilities of participants, from advanced beginners to advanced players, including classes devoted to viols, recorders, voices, and mixed ensembles, as well as classes dedicated to historical dance. The classic French chanson was the descendent of the Burgundian and Franco-Flemish forms of the late Fifteenth Century. It was crystallized after the death of Josquin by composers such as Jannequin, Sermisy, Sandrin, Verdelot, and Arcadelt. Thanks to the new technology of music printing, printed editions of chansons flooded forth from publishers such as Susato, Attaignant, Du Chemin, and Ballard. The form came to be practiced by an international array of composers including the towering figure of Roland de Lassus. The influence of the form was great; the Italian madrigal was the marriage of the modest Italian frottola with the suavely melodious chanson, and was created by Franco-Flemish composers before being embraced by the Italians. The chanson also influenced German chorales and Italian canzoni alla francese, which eventually morphed into the baroque instrumental sonata. Within France, late Renaissance chansons yielded to the airs de cours which formed the basis for the uniquely French form of opera established by Lully. El Siglo de Oro, the Golden Age of Spain, was the pinnacle of Spanish culture and influence in Europe and the New World. Stretching from the time of the Reconquista and Columbus, through the defeat of the Spanish Armada, and well into the 17th century, it was a time of brilliant creativity in all of the arts. When Isabella and Ferdinand expelled the last of the Moors from their stronghold in Granada in 1492, they put an end to a fascinating era of Spanish history which had brought together the cultures of the Moors, Christians and Sephardic Jews. Under the strengthened monarchy, however, there flourished a new period of great literature, architecture, painting and music. reached back into "pre-Columbian" Spanish courts and monasteries, and across the sea to the New World. We sampled the instrumental and vocal treasures of the 16th century Habsburg dynasty and explored the early Baroque repertoire -- all tasty tapas on our plates as we met for a week of music in the mountains. That's the English Channel, of course, and all kinds of cultural emissaries crossed it for centuries in both directions, bearing cultural, artistic and specifically musical influences and works to and from the "Fair Isles." From the importing of the Notre Dame repertory in the 13th century to the exporting of the 'contenance anglois' subsequent to Henry V's victory at Agincourt to the 'transalpine' travel of the 16th and 17th centuries and Handel's peregrinations, the blending of insular and continental influences has created some of the most appealing music in our repertoire. "On the Cusp" referred to moments in music history when many stylistic trends coalesce into what appears to be a new era and a new attitude. In 2012 we focused on two such “cusps”: the transition from the Middle Ages to the Renaissance (ca. 1450) and the Baroque revolution (ca. 1600). We studied and performed music from the mid-fifteenth century, both English and Burgundian, which reveals the infusion of the “contenance angloise” into music of the Continent, with its resulting transformations of harmony and lyricism. Composers include Dunstable, Dufay and Binchois. Music from around the year 1600 by composers such as Monteverdi, D’India, William Lawes and Schütz was explored to discover the seismic shift from madrigal to solo song, from polyphony to monody, from subtle implication of emotion to direct dramatic expression. While most of these stylistic transformations initially affected vocal music, the changes of the cusps were manifested in subsequent instrumental music as well; in our workshops we sharpened our awareness of the progressive tendencies to be found in the music of both periods. When Luther sent his “95 Theses” to the Bishop of Mainz in 1517, he marked not only the beginning of modern European history, but also a sharp break with traditional pr actices of music for the church. Believing that everyone should make a personal connection to the divine, Luther instituted congregational singing and fostered the development of simple hymns that could be sung and recognized by all. This gave rise to a rich heritage that nourished generations of composers, including the Bach family. In response, the Catholic church sought to reform its own musical practices by emphasizing musical purity and clarity of text, as heard in the work of Palestrina and Monteverdi. Outside the church, a new culture arose centering on the home and family, with music playing an important role. Luther shook up Europe in many ways, and we get to enjoy one of the good results that may outlast all the rest: beautiful music that we can play, share, and enjoy. Philippe Verdelot’s setting of a 14th century poem by Petrarch refers to current events ca. 1535: Rome had been sacked in 1527, France and the Hapsburgs were carving up Italy. Verdelot (a ‘voluntary’ Italian from France and pioneer of the madrigal) championed the cause of the short-lived Florentine Republic which fell in 1530. During the Renaissance, the centuries- old dream of a unified Italy was kept alive by artists, writers, and musicians although it did not become a reality until three centuries later. This year at World Fellowship, we will explore this culture through its music, noticing the powerful influence it radiated to the rest of Europe, generating models for all musical genres over the next several centuries. Our focus will be on those north Italian city-states such as Florence, Mantua, Ferrara, and Venice where musical innovation (along with other forms of new thinking) manifested itself most intensely. This summer, we invite musicians from near and far to travel to the White Mountains to continue their musical education in an atmosphere of tolerance and support for the arts, to parti cipate in a cross- fertilization of music-making past and present. Music has always been fluid enough to reflect contact and communication between different cultures. In the late Middle Ages, travel conditions became easier and this process accelerated, fertilizing the spectacular stylistic expansion of the Renaissance. Musicians moved about in search of continuing education, noble patrons, a position with the church, a temporary job (such as supplying music for a coronation or royal festival), an audience, a publisher, religious tolerance, or a politically stable situation. Some, like Dowland, went into exile. Wherever they went, they brought their music with them, often blending it with the music of their new locations. In this way, the instrumental virtuosity of Spain moved to Italy and on to England; the vocal virtuosity of Italy spread to Germany; and the contrapuntal mastery of the Flemish masters set the standard for all of Europe. 2008 - Quel grand plaisir! The title, “Banchetto Musicale,” may be in Italian, but it belongs to a pioneering collection of German dance suites composed in the early 17th century by Johan-Herman Schein. From Isaac, Senfl, and Hassler to Schutz, Buxtehude and Bach, Germany became a cross-roads of stylistic influences, a place where the cutting-edge innovations of Italian Counter Reformation music were reconceived by Lutheran composers in terms of their own traditions and society. Schein, who occupied the Leipzig cantor position a century before Bach, divided his efforts between music for worship and for secular pleasure, as did his colleagues Scheidt, Praetorius, and others. Music for domestic and social recreation was a particularly strong aspect of the Lutheran tradition, as indicated by titles like “Musical Banquet,” “The Garland of Venus,” and “Rustic Music-making.” In the spirit of cultivating social connections through the shared pleasure of music-making, we propose to explore the traditions, the innovations, and the synthesis found in the music of Renaissance and Baroque Germany. As far back as history records, the island geographies of England, Scotland, and Ireland helped produce unique and influential styles of music in both their written and oral cultures. From Scottish monks who domesticated early written polyphony in the 13th century, to English composers in the Burgundian courts of the 15th whose "contenance anglois" helped bring about the musical Renaissance, to Morley's anglicization of the madrigal in the late 16th, and on to the continential fashion for English and Irish country-dance and its tunes in the 18th, the island music cultures stood apart as more sensual and earthy, yet remained in fruitful dialogue with mainstream European musical developments. Our week-long exploration centers on the Elizabethan/Jacobean period, England's Golden Age, but places it in a wider historical and geographical context. Through playing, singing and dancing to this music, we will sample its unique flavors and experience it in fresh and exciting ways. The land that launched the Renaissance was a hotbed of innovation, a cauldron of intrigue, and the birthplace of a unique musical vision, forged from the combination of northern learning and spirituality with southern warmth and sensuality. Principalities south of the Alps vied with one another in the sumptuousness of their creative establishments, competing to retain musicians from Flanders, France, Spain, even England, who in turn were bewitched by the lyricism of native poetry and music. This fusion gave birth to the quintessential Renaissance song-form, the madrigal. 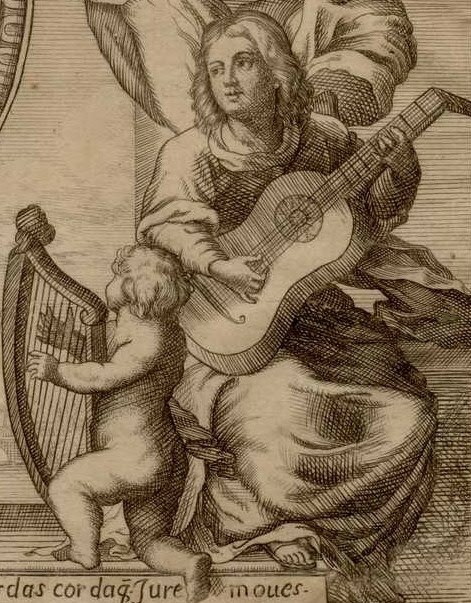 Unprecedented dissemination of the Italian Renaissance's musical products took place, thanks to growing literacy (musical and otherwise) abetted by the printing press. The expanding flood of scores and performers throughout Europe insured the survival of breathtaking riches by composers from Tromboncino and Festa to Marenzio, Palestrina, the Gabrielis, Vecchi, Banchieri, Merulo, and on to Monteverdi, Rossi, Marini, Frescobaldi and beyond. Renaissance and Baroque Music of Spain and Portugal. 2002 - Paris is worth a mass!